But weddings do offer at great opportunity for family to gather and share in a usually, most happy event. Such was the case on Thursday, October 15, 1942 when the Latimer family members got together to share in the wedding celebration of Olive Theresa Evelyn ‘Tess’ Latimer. On that Thursday, 24-year old Tess married 24-year old Carl Francis Wagner. Tess was a nurse in Orillia, Ontario and Carl was a Canadian army sergeant from Saskatchewan assigned to Camp Borden, not too far south of Orillia, when they met. The photo below is one of a few ‘snapshots’ taken by an unidentified family member on Carl and Tess’ wedding day. This photo shows Carl (far right) with Tess’ immediate Latimer family. On the far left is Tess’ father Edward Arthur Latimer, standing between Edward and Tess is Tess’ sister and maid of honour Hazel (Latimer) Filkin. Standing behind Tess are her eldest sister Albertine ‘Abbie’ (Latimer) Ensom and her brother Edward ‘Knox’ Latimer. The two girls standing in front of Tess are her nieces Pat and Jule Filkin, the only two that seemed to be able to muster smiles for the photo. This year has been rather unusual because in my part of the world, we have little or no snow on the ground. In previous years, snow has been plentiful as a standard ingredient in the Canadian winter scene. 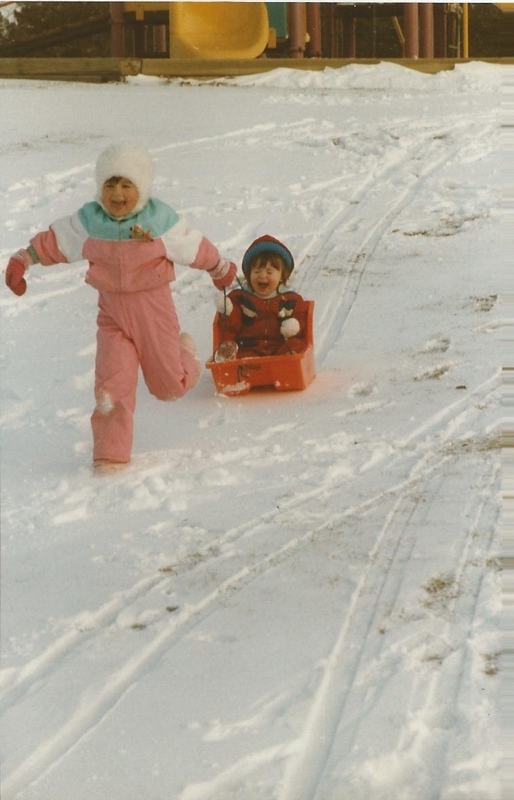 In the winter of 1991-92, my eldest daughter Lisa loved showing her little sister Jenna how to have fun tobogganing down the small hill in the park across the street from our house. Snow, a hill (no matter what the size) and a toboggan equaled hours of fun and laughter. And the fun was perfected by a cup of hot chocolate to warm up with after play time, made even better if it had tiny marshmallows on top. Three-year old Jenna Hadden loved that Santa Claus delivered a brand new pink and white with rainbow motif tricycle. Just for her. No rusted parts. No hand-me-down from an older sibling. Even riding in the family recreation room, with it’s still not replaced 1970s shag carpeting, could not wipe the smile from her face as she felt the wind in her hair (well, that part might be a bit of an exaggeration).